Marshal Tom Briscoe is charged with keeping the peace in the wild cowtown of Samaria, Kansas, but at the same time the town council doesn't want him doing anything that might run off the Texas cowboys and the valuable herds they drive up the long trail to the railhead. But when he's faced with a life-or-death situation, Briscoe has no choice but to gun down one of the Texans. Unfortunately, the dead man is the son of one of the most powerful and vengeful cattlemen in town, so as a lawman Briscoe finds himself in the unusual position of having a bounty placed on him. This is no dead-or-alive situation, however. Briscoe's enemies want him dead! 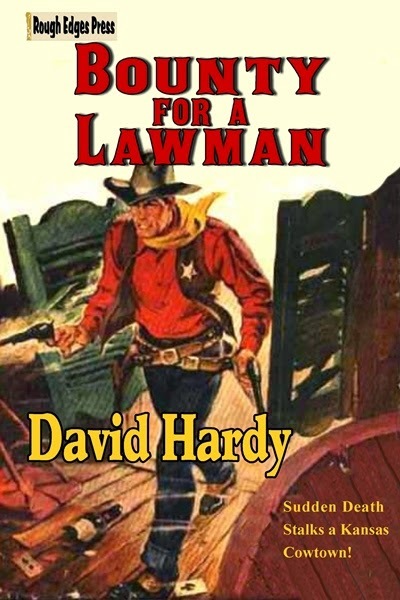 BOUNTY FOR A LAWMAN is another top-notch tale from David Hardy, auther of THE BADLANDS RUSTLERS. Fast-paced and packed with action, this is a yarn that Western readers will enjoy!